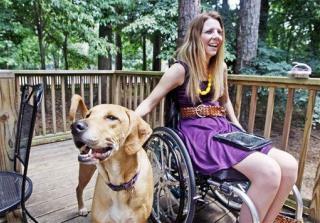 (Newser) – Rachelle Chapman, the now-30-year-old paralyzed in 2010 when one of her best friends pushed her in the pool at her bachelorette party, is talking to People and Today in advance of a TLC documentary about her story—a documentary that reveals, among other things, that Chapman is no longer friends with the woman who caused her accident. Though Chapman long defended her friend, refusing to name her publicly (she still hasn't), she says they ultimately drifted apart. Chapman tells People her friend was "distraught and depressed" after the accident, and the two supported each other. "The first year I made sure that she was OK, even more than me," Chapman tells Today. But as time went on, things shifted for both of them. When I first heard of this story, I was surprised to hear that she was still friends with the woman who caused her to become paralyzed. I am not surprised that this friendship ultimately ended. I know I could never remain friends or forgive someone who did that to me nor could I live with myself if I did that to someone else. I know she forgave the friend but it sounds like maybe the friend's guilt caused her pull away and that's what ultimately killed the friendship. Deliberately pushing someone into a pool is a really stupid and unsafe thing to do and quite honestly, I have no sympathy for the former friend and the guilt she feels. Word to the wise: always check to make sure the pool has water in it before pushing someone in it.